Elizabeth Caldwell Hastings MD (Betsy), an early female in medicine, passed away the 18th of February, 2017 at age 100 surrounded by friends at Vista del Monte, Santa Barbara. Her strong stable sense of self allowed her to offer unconditional love and support to her family and to allow others to feel special and worthy of her time and attention. A woman of grace and wisdom, she was born Jan 4, 1917 in Spencer, NY to the Reverend Albert Oscar Caldwell and wife Minnie Grace. Betsy spent her early years in Waverly, NY; graduated high school from Abbot in MA; Mt. Holyoke College in 1938; and obtained her Doctor of Medicine degree at Columbia University College of Physicians and Surgeons in 1943, as one of the few women to attend medical school in that era. At Columbia she met her future husband, Dr. T. Newlin Hastings, to whom she was married by her father in his Titusville Presbyterian Church Jan 4, 1944. During WWII, while separated from Newlin by his deployment as a Field Surgeon in 8th Armored Division in Europe, she worked tirelessly at Bellevue Hospital in New York, one day racing up the Empire State Building to triage patients injured when a B-25 bomber accidentally crashed into the building. While Newlin practiced as a General Surgeon at USC/Good Samaritan Hospital in Los Angeles Betsy dedicated herself to full time practice as a Pediatric physician working in LA County clinics, overseeing the Los Angeles Red Cross blood bank and raising 4 children as a model mother, chef, seamstress, and knitter. No matter what the challenge she would take it on, including river trips, horse trips into the High Sierra Nevada and sharing times with family and friends at the Yosemite Mountain Ranch. With retirement she and Newlin moved from San Marino to Montecito, CA in 1988. 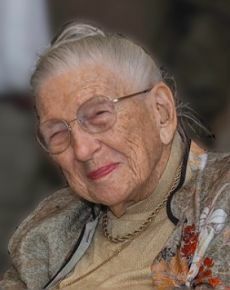 She was a voracious reader with interests in other cultures that led to extensive travels with Newlin around the world until he passed away in 2008. Her confident attitude kept her living independently and actively engaged in the lives of her children, grandchildren, great grandchildren and active in the Santa Barbara County Genealogical Society. Above all she is loved and revered for non-judgmental support and encouragement of others to live their lives according to their own hearts and drives. Betsy is survived by her 4 children (Anne & Kim Perkins of Montecito CA, Hill & Bettie Hastings of Telluride CO, Kathy & Mike Bradford of Zephyr Cove NV, Newlin & Liz Hastings of Paso Robles; 9 grandchildren Dr. Kacey & William PerkinsTift, Elliott Perkins & Steve Bishoff, Sarah Perkins & Jesse Royer, Peiper & John Kirkendoll, Dr. Laurel Hastings, Betsy Bradford & John Peretti, Kay Bradford & Rob Collier, Shannon Hastings & Josh Higa, Jamie & Caty Hastings & 6 great grandchildren: Elliott, Cole, & Hastings PerkinsTift; Dirk Kirkendoll; and Charlie Perkins & Blaize Royer. Betsy, still engaged, celebrated her 100th birthday at Vista del Monte on Jan 5 and at the Little Town Club in Santa Barbara Jan 6 with 59 friends and family. Donations in her memory can be made to the Thacher School Scholarship fund & Direct Relief.